slight or incomplete paralysis. adj., adj paret´ic. general paresis chronic meningoencephalitis from a syphilitic infection that is causing gradual loss of cortical function, resulting in progressive dementia and generalized paralysis; this may occur 10 to 20 years after an initial infection of syphilis in untreated individuals. Called also Bayle's disease and dementia paralytica. (pă-rē'sis, par'ĕ-sis), Although the classically correct pronunciation of this word is with stress on the first syllable, the second syllable is commonly stresed in the U.S.
/pa·re·sis/ (pah-re´sis) slight or incomplete paralysis. general paresis paralytic dementia; a form of neurosyphilis in which chronic meningoencephalitis causes gradual loss of cortical function, progressive dementia, and generalized paralysis. 1. Slight or partial paralysis. pa·ret′ic (pə-rĕt′ĭk) adj. & n.
1 also called dementia paralytica, general paresis, paralytic dementia. motor weakness or partial paralysis related in some cases to local neuritis. 2 a late manifestation of neurosyphilis, characterized by generalized paralysis, tremulous incoordination, transient seizures, Argyll Robertson pupils, and progressive dementia caused by degeneration of cortical neurons. Paresis resulting from untreated syphilis usually develops in the third to fifth decade but may occur at an early age in patients with congenital syphilis. paretic, adj. Neurology Incomplete paralysis, weakness; partial paralysis of voluntary and involuntary muscles. See General paresis, Quadriparesis. 1. Partial or incomplete paralysis. 2. A disease of the brain, marked by progressive dementia, tremor, speech disturbances, and increasing muscular weakness; in a large proportion of patients there is a preliminary stage of irritability often followed by exaltation and delusions of grandeur. WEAKNESS or reduction in muscle power, as compared with complete PARALYSIS. n a progressive psychosis associated with neurosyphilis. slight or incomplete paralysis. Includes the animals that can make purposeful attempts to rise without being able to do so, those that are able to rise with assistance, those that are able to rise and walk with major difficulty including frequent falling, and those able to stand and walk without assistance but with slight errors, e.g. stumbling. a stage or form of hypocalcemia in which the patient remains ambulatory. 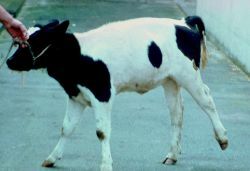 an inherited defect of cattle that appears several months after birth. A hindleg is stiff and straight on rising and the hoof does not reach the ground. After several minutes the gastrocnemius muscle relaxes and the animal walks normally although the leg is still abnormally straight. Gradually the stiffness worsens until the animal is unable to walk. Called also Elso heel. see dural ossification, degenerative myelopathy of German shepherd dogs.